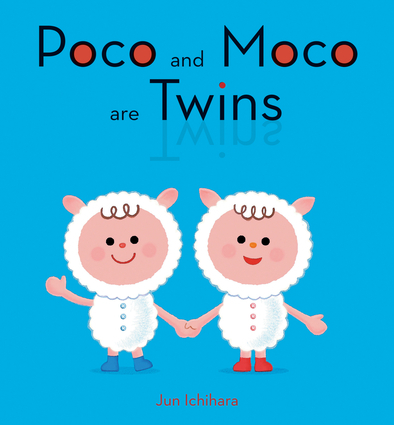 Poco and Moco are twin lambs. They look almost exactly alike, and they get along so well that they spend every minute of their day together. But they’re also different in a lot of ways. For one thing, Poco is a boy and Moco is a girl. Poco likes breads and rolls, but Moco likes cakes and pastries. They both like donuts, so if they only have one, they split it in half. Poco likes to play hide-and-seek, Moco loves to climb trees. And when they join forces they can do things neither of them could ever do alone.The use of fold-outs, cut-outs, and other special features add an extra element of fun as readers get to know the twins and explore differences and similarities. Jun Ichihara was born in Aichi Prefecture and graduated from Osaka University of Arts. In addition to creating picture books, he works as an illustrator for books, magazines, and ads. His picture-book titles include Wakuwaku ABC bukku (ABC Excitement), Nikkori niko niko (Everybody Smiles), Waratta (Theeere's the Smile! ), and Sugoi kuruma (Awesome Car).